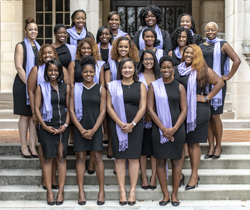 Epsilon Sigma Iota Sorority, Incorporated (ESI) was founded on November 4, 1920 and incorporated on June 17, 1921 at Howard University School of Law. The founding women of excellence were Pearl Beldon, Willie Hazel Blount, Ollie May Cooper, Margaret DuBose, May Corinne Martin, Bertha C. McNeil, Zephyr Abigail Moore, and Gladys Tignor Peterson. The organization was chartered with a threefold purpose. First, the sorority was to serve as a tool to motivate women to become lawyers. Second, it was to serve as a conduit to placing female Howard Law graduates in meaningful legal careers. Finally, it was to create a useful network of female graduates. To encourage women to assume leadership positions in law school and throughout the legal community, to provide opportunities for networking and mentorship, and to promote the role of women as legal practitioners, academicians and scholars. The Sorority is to serve as a vehicle for achieving these goals, with an ultimate aim of facilitating the overall advancement of women, especially those of African descent, in the legal profession. While ESI’s mission continues to encompass the focus of networking and mentorship that was established by our founders, we have additionally committed ourselves to community outreach and economic development. ESI seeks to empower women through programs that focus on academic, professional and personal development. Most importantly, we encourage women to assume leadership positions at the law school and in the greater legal community. Epsilon Sigma Iota, incorporated in 1921, was founded for social and educational purposes, and to induce other women to enter into the study of law. Today, our focus has expanded to include promoting the advancement of women in the legal profession, especially those of color and from disadvantaged backgrounds, for the ultimate purpose of achieving a better, more prosperous society. Each year the Sorority hosts a Mock Exam, which provides 1L students with the opportunity to participate in an exam simulation in preparation for their actual exams. Students are frequently encouraged to take practice exams under actual testing conditions and this program gives students the opportunity to do so. Students are encouraged to then take those exams to their professors for review and feedback. Additional study tips are provided to participating students. The afternoon tea is a mix and mingle event held in the fall semester. The purpose of this event is to bring the school community together in fellowship. After a brief welcome, the 2L and 3L attendees answer any questions that the 1Ls may have regarding law school and provide them with advice and encouragement. Networking 101 generally takes place during ESI Week, where a panel of sorority alumnae discuss important “do’s and don’ts” of networking in various settings. Attendees are given the opportunity to ask legal professionals specific questions about successful networking skills. The Program is followed by a networking reception.